Learn to needlefelt by making your own felted badger. This course is aimed at those who have tried their hand to needle felting in the past, but are looking fora little guidance to help develop your style. 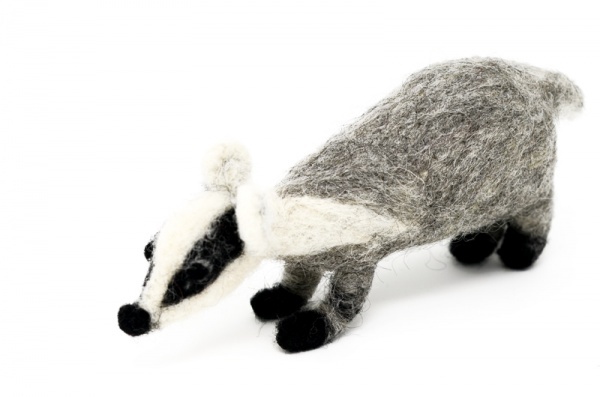 In this course you'll be making a 3D needle felted badger, all under the guidance of tutor Dawn Smith. Dawn will go over the core skills, as well as adding her own hints and tips along the way, to make it that little bit easier to find your own style. You'll end the day with your final piece, together with plenty of skills which can be transferred to other felting styles and pieces and hopefully a few new friends! Course Level: Intermediate - You don't have to be a pro, but it's expected that you've had a go at a few simple designs and are familiar with the basics of needle felting. What's included: All equipment and fibres needed to make your badger are included in the price. What you need to bring: Please wear clothing suitable for a day of arts & crafts! Sensible footwear is recommended.